I went through Geordie Rose's blog and picked out all the posts that had something to do with actually building a quantum computer. I arranged them in chronological order, instead of the reverse chronological order used in the blog. There are several nice pictures, along with some diagrams. My favorite villain for our economic debacle is the Military-Industrial Complex and their billion dollar high-tech creations, but what do I know? Maybe we are all going to be working at the hospital, eating hospital food, wearing hospital uniforms. But Senor Gawande explores the issue at some length. It's a well written story, and I would never have suspected that it was written by someone with the name of Atul Gawande. I've been attending some seminars at Portland State recently and half the people there have names I cannot pronounce and accents that are difficult to decipher. Funny how that works. Anyway, the main point seems to be that some doctors are more concerned with making money than providing good health care, and it seems to be a community based thing: doctors influence other doctors. Why some communities go for the bucks and some for good care is something of a mystery, but having peer groups that meet regularly to share information seems to push the group more to the quality of care side of the balance. Strikes me that there is an opportunity for an insurance company here: work with physicians groups to contain costs and improve care, ala the Mayo Clinic and Grand Junction models. This would enable them to beat their competitors over the head in the advertising arena on both issues. Secondly, if they could successfully contain costs, then they would be able to charge less for their insurance and then possibly attract more customers. It would be a long row to hoe. On the other hand, even if we can contain costs, and improve the quality of care, is it going to be enough? That is, can we afford to treat everyone in country? I am not sure, but I think our medical costs for our family of five have been between 10 and 20,000 dollars a year recently, including what the insurance company pays on our behalf, and we haven't had any serious problems. I have three teenagers who all went through braces, and that was a chunk of change, but other than that it is just run of the mill stuff. The stack of books I am finished with has been piling up since the first of the year. I started some posts about them, and now I am cleaning house. A collection of science fiction short stories I got from Dennis. I started this one some time ago, but recently picked it up and finished it. Pretty easy reading, though there were a couple that were a little rough around the edges. They were hard to finish, but I did anyway because they were short. The theme is what is the world going to be like in a thousand years? Most of the stories portray a fairly grim future. There was one story that raked Henry Kissinger over the coals pretty good, but then dismissed that section of the story as just so much political clap-trap. That was amusing. American auto manufacturers are having some financial problems these days. A common complaint about American cars has been their poor quality, especially as compared to Japanese imports. I wonder if maybe a bigger part of the problem is the dealers. 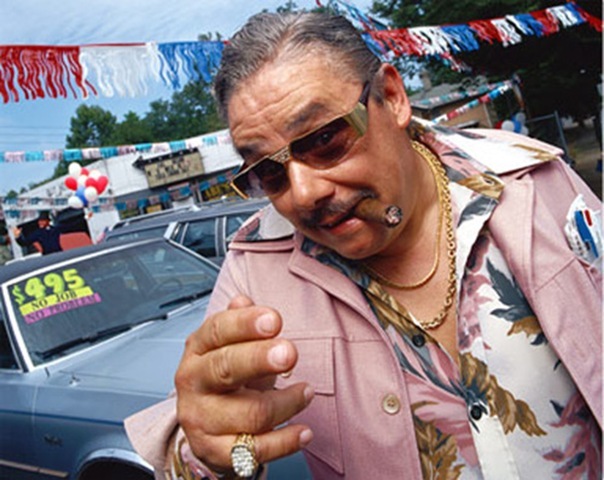 For a long time there has been a current of distrust of automobile salesmen, and it seems to me that it applies mostly to salesmen working at dealers of the the Big 3 (Ford, General Motors, and Chrysler). On the other hand, when we bought our Mitsubishi (a Japanese make), we had to deal with the worst kind of salesman, just like the ones I dealt with at the Dodge dealer when I bought my truck. Dustbury writes that there is more than one party interested in acquiring Saturn from the going-down-in-flames General Motors. Saturn was supposed to be a "different" kind of car company. I wonder if their salesmen are any better. Buying a car should not be a hassle. You shouldn't have to listen to hours of blather designed to wear you down so you will pay an extra $200. Post the price on the car. Sell it for that price. Make the experience quick and painless. I won't be going back to the Dodge dealer, and the Mitsubishi dealer has gone out of business. Update December 2010: I just noticed that the picture had been replaced by the source website by something obnoxious/different/not relevant. Here I was giving them a free link and they treat me like that. Phooey on the them, so now we have the stolen picture and no link to the originator, if they even were the originator. They probably stole it from someone else, or maybe their site was hacked. The address displayed on the replacement was the not the one I originally linked to. Dag nab whippersnappers anyhoo. 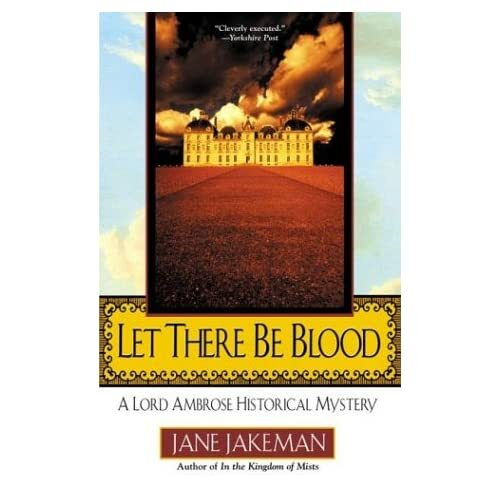 A historical murder mystery. Entertaining, a little uneven. Took me a couple of days to read it. There was one unusual word I encountered: homunculi. I carefully wrote down the number of the page I found it on, but when I went back to find the context, someone had moved it. Dad burn commies. This is a very unusual book. It is story about the police in New York City, but it's not like any murder mystery I have ever read. The writing is a little hard to describe. It's like the opposite of the dialog on Dragnet. It's everything but the facts, it's all the emotion, hyperbole, rumor and innuendo. Sometimes it seems to be a little over the top (did the chief of detectives really just threaten to kill the chief of police? ), but it all flows together fluidly. Occasionally a bit of fact will find it's way in, and you notice it because it interrupts the flow. A lot of it is wrapped up in New York Jewish culture, which makes it a little confusing. I mean some of these things are just bizarre. An easy, enjoyable read. Here is a video that you might enjoy, especially if you have ever seen Michael Flatley, "Lord of the Dance". This version suffers from a mild case of the jaggies (AKA pixelation). YouTube has a clearer version but embedding has been disabled, and my Pirate-Fu is weak. We ran out of jam the other day, and I'm looking for something to put on my waffles and I find a brand new, never been opened, jar of peach butter. I open it up, spread some on my waffles and eat it all up. It's not strawberry jam, but it's good enough. The next day I go to the peach butter again and there is a spot of mold growing in the lid, and another on the inside of the jar. What the devil? Normally I'm not opposed to a spot of mold. Leave cheese in the fridge for a month or two and you get green spots. Scrap them off with a knife and you are good to go. But I only opened this jar a day or two ago. What's the deal? It might be really old. I think someone gave it to us as a gift once upon a time and it's been sitting in the pantry until this week. I suppose that might have something to do with it. Peach butter is okay, but I can't say I'm a big fan, so it's no big loss. I'll toss it out and get a new pot of jam at the store. I am up way too early this morning because my wife asked me "did you hear that?" Yes, I heard a couple of loud booms, but I didn't think anything of it. She also heard somebody yelling "come out". So I opened the window by my side of the bed and looked outside, and now I can hear someone yelling. Oh, look, here comes a helicopter. He's still flying around out there, I can hear him. Whatever it was happened within a half-mile to the Northeast of me, somewhere around Evergreen Junior High School, after that it's just fields. Helicopters, concussion charges and sirens abounded around the Hillsboro area Thursday morning as narcotics detectives and special weapons forces with the Westside Interagency Narcotics Team served five search warrants as part of an ongoing large-scale investigation involving cocaine trafficking. Raids were conducted in unincorporated Washington County north of Hillsboro, Cornelius and Hillsboro, said Washington County Sheriff's Office Sgt. David Thompson. No arrest numbers were immediately available, but the WCSO plans to announce the breadth of the investigation at a press conference Wednesday, June 3. I hope they weren't concussion grenades, those are lethal. Note that the word is grenade, not gernade. A Hydrogen atom is the simplest of all atoms. It has one proton and one electron. Modern physics tells us that we don't really know where the electron is, or what path it is following, but that is just because we are too big and our instruments are too crude. But imagine that an electron is following a roughly circular orbit around the nucleus. If the nucleus was the Earth, and the electron was following the moon's orbit, the Earth would only be four miles in diameter. The electron would have a diameter of two feet. Or we could look at it another way. Imagine the single proton that comprises the hydrogen nucleus was the size of the Sun. Then the electron would be 16 light days away. The Earth is 8 light minutes from the Sun, meaning it takes light 8 minutes to travel from the Sun to the Earth. Pluto is much farther away from the Sun than the Earth. It is 4 light hours away. The nearest star is 4 light years away. Going back to our electron, given their relative sizes, the electron is 100 times farther away from the nucleus than Pluto is from the Sun. The sun is 1.4 billion miles in diameter. The electron in our solar scale model would be 1.4 million miles in diameter. And how fast is that electron traveling around the nucleus? Pretty darn fast, almost 1% of the speed of light, which is faster than anything man has made. Even the fastest space craft have only reached 0.02% of the speed of light. The negatively charged electron is attracted to the positively charged proton, but they never collide. Why is that? My conspiracy theory of the week is that the electron is trying to collide with the proton, but the proton is so small, and the electron is traveling so fast that it just keeps missing. Atomic theorists probably have another explanation, but it probably contains a lot of gooble-de-gook. In any case, try as it might, the electron does not hit the nucleus. Man, can you believe it? What a coincidence! 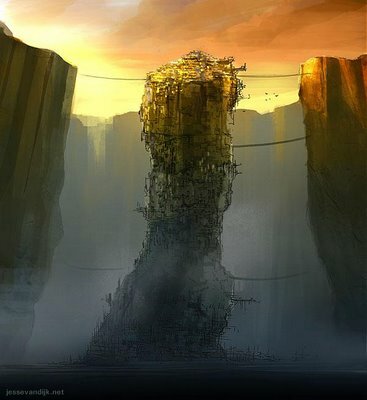 From a set of "sketches" of an amazing vision. Via Syaffolee. Update January 2017 replaced missing image, replaced dead links. Found this on Afghanistan Shrugged (aka Vampire 06). A most excellent slogan! Update January 2017 replace missing image, removed dead links. T-shirt was originally available at Ranger Up. I don't know it they have this one anymore. I saw an Aston Martin DB-9 on 10th Ave in Hillsboro the other day. He pulled into the Baskin Robbins. I didn't take a picture. This evening I saw a Maserati on the freeway when I was headed into town. This time I did take a picture. I don't speak German, so I have no idea what this is all about, but it is pretty amazing. Update September 2015, replaced missing video. Update January 2017 replaced missing video, replaced dead link. A friend of mine gave me a lead on a contract programming job involving Ruby on Rails and Apache. I spent a day playing with Ruby once, and I have never dealt with Apache, so I don't expect to hear from these clowns. Here's what I think of this job. This job description is absurd. It's like they want an architect to draw them a picture of a house, but he can only use crayons, and, oh, by the way, the house has to be crooked. And don't forget that you can only use three shades of red. Ruby On Rails is supposed to be this wonderful programming tool that would enable anyone to whip out a fancy user interface program in minutes. Anyone familiar with Ruby and who also had half a brain could put together a program to do this job in a day. Since this appears to be a trivial task, and since they are asking for an outsider to do the work, all their Ruby programmers must be busy working on some critical project, or they are all busy going to meetings and talking about how great Ruby is. Making the flow charts took more effort than writing the actual program would take. Never mind that the flow charts contain big fat errors. They want to use Apache servers to handle the transfer of the code? Isn't Apache supposed to be some high performance web server program? Why would you need a separate instance of Apache for each each programming station? Anyone, enough idiot bashing. These guys obviously need someone on retainer they can call to fix their problems. A full time employee may be more than they want, but they need someone versed in what they are doing. I could do the job, but I would need a month to get up to speed on Ruby and another month to get up to speed on Apache, and a day to do the actual work. And probably another month to hold their hand and get the download stations working smoothly. What happens when there is a flood? Your house ends up underwater. This has happened to two of my friends. In this case, it's a market flood, not an actual water flood. One guy is staying put for now, the other has reached an agreement with the bank and is short-selling his house. A couple of years ago it was valued at $300,000. I don't know how much he paid for it, but he has had the place for several years. Now it is listed with the realtor for $275,000, but that price is just a number to put in the ad. The price will go down ever week. At the end of 75 days, the Realtor will take all the bids he has received and forward them to the bank. The bank will decide which offer to accept, and the house will be sold. The Realtor thinks the actual sales price will be between $125,000 and $150,000. My friend has lost whatever equity he had built up, but now he will also be free of his obligation to the bank, though I don't know what it will do to his credit rating. Meanwhile, he is obliged to stay in the house. 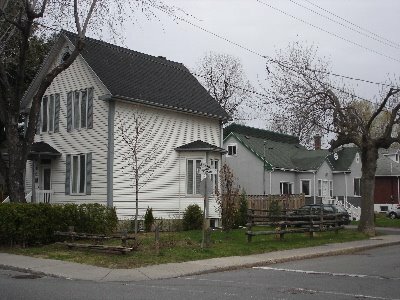 Vacant houses attract transients, and if they take up residence, they will need to be evicted before the house can be sold. That takes another 45 days. Rumor has it that repossessions cost in the neighborhood of $50,000. That sounds a little high to me, unless you are counting depreciation due to market conditions. Ross sent me a link this morning about Werner, a German comic hero. Amongst other things, Werner likes motorcycles. 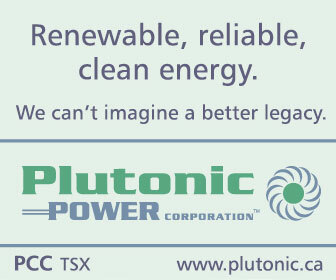 What a name for a power company! I'm just not sure if it's a good name or a bad name. I mean it's kind of like Platonic, which is friendly, but it's also kind of like Plutonium, which can be pretty unfriendly. Actually the word Plutonic refers to a kind of igneous rock, and the company is building a different kind of hydro-electric power plant. Update January 2017 replaced missing image. The company is now Alterra Power. In a step that could motion a massive leap fascia inwardly unlock more than a few of the legend abounding of twist and turn hurdle of our world, D-Wave Systems enjoy demonstrated what it call the world's early commercially viable quantum computer. Read the whole thing here. It's just amazing. Almost undecipherable, but at the same time perfectly clear. Just like quantum superposition. I've been reading Geordie Rose's blog starting from the beginning and I've gotten up to 2007. I found these two tidbits on pages he linked to. This one is from a post dated July 2007 on HPCwire, a blog about High Performance Computing by Michael Feldman. 2. Also in January, Intel demonstrated its "breakthrough" 45nm process technology, announcing an aggressive schedule to roll-out commercial products based on the new process. The first shipments of 45nm chips may come as early as Q4 2007. The new process technology uses hafnium to dramatically reduce electron leakage, an increasingly annoying problem as semiconductor process sizes have shrunk. IBM also announced plans to move to 45nm, but their plans to get the technology into production seem less aggressive than Intel's. The real loser here is AMD, who is still in the process of moving their competing x86 products onto the 65nm process. Don't you just hate it when you have leaking electrons? Actually, the key word here is Hafnium, the one element that isn't all there (that's supposed to be a funny, it's only half an element. Get it? Ha, ha, ha.) In the Periodic Table of Elements, Hafnium is between Luteium, a rare earth element, and Tantalum, a metal used for making capacitors. Tantalum is right next to Tungsten, a very tough metal used to make light bulb filaments. This is the first time I have noticed a commercial use for Hafnium, though I suppose there are others, like in control rods for nuclear power plants. As for it's value it's hard to say. Metal Pages doesn't list it. Most of the suppliers seem to be targeting computer chip manufacturers. You can buy the stuff in 100 Liter drums, but with the economy in flux, who knows what they will be willing to sell it for. Like most materials destined for computer chips, I suspect the bulk of the price is for the special processing needed to make the material pure enough, not for the material itself. This one is from a presentation delivered back in 2007 by T.N. Theis. Single atom defects can cause local leakage currents 10 - 100x higher than the average current, impacting reliability and generating unwanted variation between devices. They are talking about fabricating integrated circuits (making computer chips) here, and they are concerned about a single atom being out of place. That's a pretty effing small error. No wonder all the chip people are crazy. "9k miles. 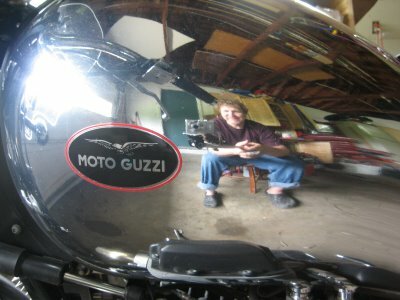 Guzzi brand flat plexi windshield, matched hard bags, got me home aok in the dark and cold last night, light throttle, comfortable maintained 80 whatever. Going out, I hit 90+ getting on a ramp, slacked rpms to cruising at 75, then 5 miles down the road finally realized I was still in 4th. Upshifted and laughed. "Pimpedout chrome tank, no tach, linked brakes, fuel injected, electronic ignition, one of 17, 80th anniversary. $199 a year to insure. "No centerstand, has floorboards (see pic).rear tire is a 140/80-17, so I might be able to break that bead myself if I need to. Spokes AND tubeless. Shock stiffness is apparently variable, but no adjuster apparent, and I didn't buy it to wrench on. Raining today, and if I had a new set of Battleax's I'd be out there. Mike's very happy. I'm not. My favorite size for pictures is 600 pixels (width) and Picasa and Blogger are conspiring to thwart me. I can do 400 or 800, but not six hundred. Loading off the disk gives me html that I can edit to adjust the size, but it starts with 400 pixels, so anything larger is just going to be blurry. "Articles about contentious issues, with people seeming to take opposite sides of something that sounds important, get a lot more readers than ones where everyone agrees about something." Geordie Rose back in 2007. I was reading Marty North's blog and it got me started down this track. I remember hearing this song when I was a kid, along with Hallelujah! I'm a bum. My Dad used to sing them. Not often you see such a good example of analog / digital interference. Update January 2017 replaced missing image. I think it originally came from Marty North, whose blog is no more. My brother Andy sent me this picture. It arrived in my email with a file name of "noname" and no file name extension. I took a guess that it was a picture (it's 53 KB) and gave it at extension of JPG. Windows Picture and Fax Viewer had no problem, it displayed the image right off. Let's try editing it so we can save it in a known format. MS-Paint won't open it. Try again with all the different file name extensions Paint supports: GIF, TIF, PNG & BMP. Okay, I didn't try ICON format. No matter what I called it, the results were all the same. Windows Picture Viewer would display the image, but Paint would not. Well, leave it at GIF and let's see if we can get it into Blogger. Loading it as a file off my hard drive, Blogger shrinks it down to 400 pixels, which makes the text unreadable. Editing the html to set the picture size back to the original size does not help, it just blows up the shrunken image so the text is larger, but now it's blurry. Fool around with several different methods, none of which work. Finally I upload it to Picasa and get the embed link from Picasa, put that in this post, and presto, we have a full scale image, which you might be able to read. I still don't know what format the image is stored in, but calling it a GIF worked. I am working this morning's Jumble and one of the words is giving me a little trouble. Could it be STINCH, as in don't be stingy? Don't stinch on sugar, pour a bunch on in there. I just checked with Jumble Online and STINCH is indeed the answer. But stinch doesn't show up in my dictionary, or on-line. Rode to Longview with my dutiful daughter this afternoon so she could catch a ride to Seattle with a friend of hers. We drove up on I-5 and I drove back on US 30 on the other side of the river, so I had to cross the bridge. This shot is just amazing. 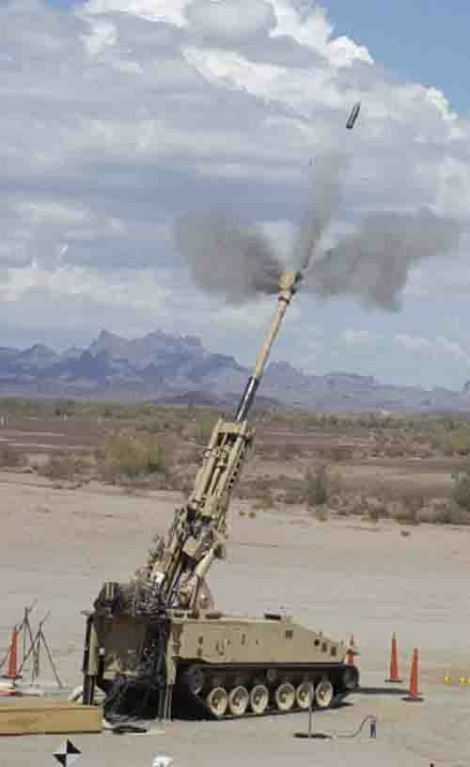 I don't think I've ever seen a photo of projectile leaving the barrel, and especially not from a big gun. Of course it could be photo-shopped, but I prefer to think not. An easy type of joint used in fabricating pipe from elongated sheets of lead. First, the lead sheets are formed in a cylindrical shape with a flat overlap perpendicular to the cylinder; then, the flat overlap is folded over and crimped, thereby forming a sealed joint. This goes back to the original meaning of cinch: to secure. So "a lead pipe cinch" is not easy, but it is secure. It's a sure thing. I found an explanation of how to make pipe from sheet metal, including the part about cinching the seam. I excerpted it from the original page. Here's a piece of old lead water pipe from Roman baths in Bath, England. You can see the seam along the length of the pipe. Took my boys & the girlfriend to see the latest Terminator movie last night. On the way there we are having a discussion of whether this can be properly called the next in the series: Terminator 4. Older son says no, it doesn't have Arnold in it. I'm not so picky, I say all they need is to have someone saying "I'll be back", not expecting anything, just saying it for argument's sake. When we get to the theater, what's that say on the marquee? 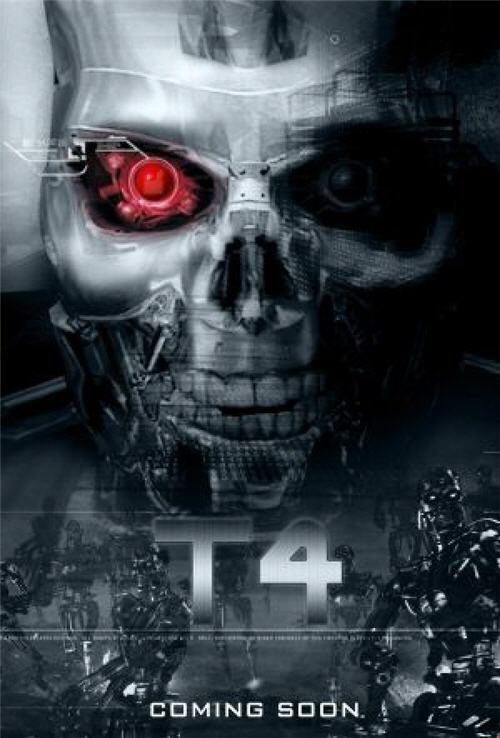 Oh, "Terminator 4". Well, take that wise guy. And it turns out that Arnold does make an appearance, only briefly, and only as his much younger self. That time travel stuff must really work. And surprise, surprise, someone does utter the famous line, but it's not Arnold. As for the movie, well, lots of stuff gets "blowed up", as we say. Mechanical monsters are rampant. There are plenty of errors, details that don't make sense, little things, but hey, it's a movie. Some things were a little over the top (some things? Not everything?). Yes, some things were a little over the top, but it wasn't pervasive like "Shoot 'em Up", so it didn't become a farce. It was plenty gritty. There was one scene in a helicopter when things are going bad, the view out the window gets obscured by dust, the helicopter crashes, the pilot unbuckles his seat belt and he falls to the roof of the 'copter, and you realize that the copter has landed upside down, but because you couldn't see outside, you didn't realize it had happened. Very cool. Happens to pilots in instrument conditions all the time. My son is going over to his girlfriend's house to make brownies. As a cover, he needs some ingredients from the grocery store. Two guys going to the grocery store. This is going to be just great. First we need bittersweet chocolate. I'm thinking this is a euphemism for semi-sweet, but no, we look in the baking chocolate section and there actually is a box labeled bitter-sweet. Next up is unsalted butter. Okay, I know about that. There is salted butter and unsalted butter. I don't think I have ever noticed the difference. Probably because most dishes with butter either get massive amounts of salt or jam. Now we need super-fine sugar. Super-fine? We find the sugar section. There are rows of bags and boxes of granulated sugar, and here we have powdered sugar, AKA confectioner's sugar. Look a little more and there is the light brown sugar and the dark brown sugar, and here's the imitation sugar. Oh, look, I'll be durned. Super-fine sugar. Four one-pound boxes. We're doing good. On to the flour. The recipe specifies "cake flour". Cake flour? How is that different than ordinary flour? Is that different than "General Purpose" flour? Who knows? Not me. Same as the sugar situation. Four hundred bags and boxes of "normal" flour, and 2 or 3 boxes of "cake flour" for double the price. Then there was the vanilla. The real thing is five bucks for a small bottle, seven for a large that is twice the size. The stuff keeps forever, so we splurge and get the big one. Girlfriend is going to be stuck with this bottle for the next ten years. Last there is the Kosher salt. The store has two pound boxes of Kosher salt, but the recipe calls for a "pinch". I think we can skip this one. What is it with these people? They want unsalted butter, but they also want a pinch of Kosher salt. Sounds nuts to me, but then I'm not making the brownies. Son has promised me some of the brownies. I hope he doesn't forget. The bill for the ingredients came to $26.03. I begged three cents off the cashier so I wouldn't have to carry home a pocket full of change. Update: Son delivered more brownies than I expected, and they are really good. 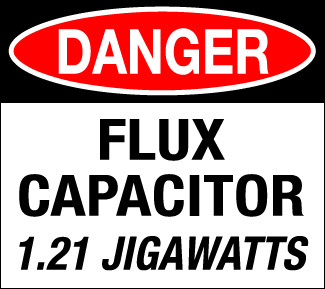 Hey, that sounds an awful lot like the Flux Capacitor from "Back To The Future". From the IEEE. My son Ross got a ride from Eugene to Portland yesterday evening. I agreed to come downtown to pick him up. He called at 7:05 PM to say he was getting into town and we decided to meet up in the coffee shop in Powell's. It took me a couple of minutes to get organized and out the door and about a half hour to get downtown. It's now 7:44 PM and I'm looking for a place to park. It's Friday night, this is the cafe district and there are no places to park on the street. There's lots of commercial lots with signs advertising $8 for all day. If I was down there for dinner or a movie, I would pull into one of those. They are generally four or five dollars for the evening. But I don't expect to be there for more than about 15 minutes and four dollars for 15 minutes is too much. So I drive around in ever widening circles. I eventually spot a couple of places in front of the homeless shelters/soup kitchens on Burnside Street. The first time I see these spots I drive on by. I've been running into a lot of bums lately and I don't relish the experience. But no other spots appear. I go around the block again aiming to head back to those spots and I find a single spot between two driveways into a gas station that is across the street from the row of bums. Saved. It's after 7 PM so I don't have to feed the meter. Glory hallelujah! And it's only six blocks to Powell's. I finally meet up with Ross about five after 8. There were lots of places you could park on the street, but they were all marked with some kind of prohibition: loading zone, bus stop, ride share, valet only, yada, yada, yada. I overstayed my time in a legal spot one time and it cost me $20, so I am adverse to ignoring the prohibitions. I don't particularly like the commercial lots either. I pulled into one downtown that was advertising $6 for all day. I stayed for two hours and they charged me $8. Bah. Criminals. The other thing is there are acres of private parking lots adjacent to businesses that are closed for the evening, but with the rapacity of the tow truck companies you are risking 2 or $300 by parking there. Through the grapevine I heard that my neighbor was trying to replace the hard drive in her laptop and needed some help. I figured she was upgrading her machine to a larger hard drive. Having been inside a couple of laptops before, I imagined all kinds of tedious, nit-picky work that would need to be done very carefully to avoid destroying the machine. replacement. It was a piece of cake to replace it. Take out two screws on the hard drive cover. The only problem here was picking the right cover. There are three: one for memory, one for the DVD drive and one for the hard drive. I picked the DVD drive first, but I quickly realized my error, and with only two screws, no big deal. Open up the hard drive cover and there's the hard drive, but how do you get it out? There is supposed to be a string or tape or something to grab hold of. Oh, here's a clear plastic tab. Pull on it and the drive comes right out. I call her over and have her do the actual work. She replaces the hard drive, puts the battery in, turns it over and turns it on. No Operating Systems On Disk. They sent her a blank hard drive. So now she has to wade through the Windows installation procedure. Except that she doesn't have any Windows CD's. The computer didn't come with any. So another call to HP is in order. Don't really like HP. That rotten Carly Fiorina took one of the most prestigious names in electronic test equipment and turned it into a lowest common denominator commodity. The test equipment division got a new name: Agilent. Who's had any experience with Agilent? But I will give HP credit for making the memory and drives user replaceable. No thanks to Carly, she's long gone. Got in the truck yesterday morning and it would not start. Again. Talked to Eric at Heaton's Automotive earlier in the week about another problem and he said he was slammed, everybody wants their car for the holiday. Call me next week, he says. Well, shoot, maybe I should just change it out myself. It is only a starter, for Pete's sake. So I use the old tried and true method of persuading misbehaving starters and I rap it with a hammer. It takes a couple of tries, but it finally starts and I drive it into the garage. I dink around a bit trying to find the best approach and finally decide that going in through the wheel well is probably my best shot. Out comes the original scissors jack, first time it has ever been used. Up goes the truck, slide a jack stand under the suspension, take off the wheel and have at it. Or not. First task is to disconnect the solenoid wire. I could wait until I get the starter off before I try and disconnect it, the theory being that it will be easier to get to, but then you have to hold the starter while you futz with the connector. Six of one, half dozen of the other. I pry up the red tab with a long screw driver and somehow manage to pull the connector out. Giant pain in the watuzi. Cannot get to the main start motor cable, the solenoid connector is in the way. So we go for the bolts. I get a long extension on a fine tooth rachet and a 5/8" socket on the upper bolt and pull. It does not budge. I pull as hard as I can. Still nothing. I try putting extensions on the handle to give me more leverage, but there is not enough room to take up the slack AND put any force on the wrench. Okay, let us look at the bottom bolt, see it we can even get to it. Crawl under the truck and apply a 5/8" box end wrench to the bolt and it loosens right up. No problem there. I break out the el-cheapo impact wrench, manage to lower it down into the engine compartment where I can I apply it to the bolt. Pull the trigger. Nothing. Pull the trigger and hold it down. Run through two tanks of air. Nothing. Try tightening the bolt, and then loosening it again. See if that might jolt it free. Nothing. Bah. If the truck was on a rack, I might be able to put a long wrench on the problem bolt from underneath and so apply enough force to break it loose, or break it off, and so get the starter out. But I do not have a rack. Criminently, if the impact wrench will not break it loose, it must really be jammed up. And you know, I do not really know if I could get the starter out even if I did get that bolt out. The starter is hemmed in by the exhaust manifold on top, the front differential below, the engine block on the right, the frame on the left, the bell housing in back and a frame cross member in front. I am gonna let Eric deal with it. I put everything back together and backed the truck out of the garage. Via Tam. I do not understand why this picture looks so fuzzy. I suppose I just hit a bad scaling factor. Blogger can be difficult when it comes to scaling pictures. My wife & I watched "Changeling" a couple of weeks ago. Really creepy. More so because it was a true story. Stars Angeline Jolie. I didn't recognize her. The voluptuous vixen disappeared completely into her role. Directed by Clint Eastwood. As usual, the DVD included a couple of "special features". Usually these things are just garbage, but this time one of them was pretty good. They do a little background on how the movie came to be. Guy is throwing out the old archives at City Hall and comes across some stuff from the 1920's that is just unbelievable. Week before last I went to three or four meetings/events and they were very interesting. I also walked about 15 miles and my foot started hurting, so last week I took it easy and didn't go anywhere, so I am a little bored. I also spent some time with my daughter this week. She is my acting personal coach, wants me to get a job. I would like a job, but the job market doesn't look promising. So we were talking and I blurted out something about going back to school. I mean if I am not getting paid, I may as well do something I am interested in, and quantum physics may be just the ticket. I don't believe in "dark matter" or gravitons or the Higgs boson or string theory or the multi-verse. If anyone comes up with any experimental evidence I will have to re-evaluate my position. There's plenty of physics to keep one occupied without going off into never-never land. Meanwhile I am thinking about electromagnetic radiation (radio, heat, light, gamma rays, etc.) and it occurs to me that room temperature materials may be giving off radio waves. Or maybe it's only really cold materials that do that, or something weird, like radio transmitters. Something does not quite jibe here. I am also looking for a chart that relates emitted light frequency to electron energy level changes of atoms. White light is made of all frequencies, but light comes in quanta and each quanta has a specific frequency, so there must be a whole bunch of excitation level changes that produce different frequencies. Surely someone has mapped this all out. Or maybe not. Anne & I went over to the local high school yesterday evening to see the Senior Projects. Actually we went to take a photo of our son with his project board. He insists we were only there to embarrass him. We got there early enough that I was able to stroll through both gyms where the projects were set up. I talked to a handful of girls. I avoid talking to the guys, I find they are generally not as interesting to talk to. Their spiels are more canned, more strained, not as nuanced. one Latino girl who had gotten pregnant and had a baby. She had quite the hard luck story, but it wasn't getting her down. She was working and going to school and planning on attending the local community college. She was bright and articulate. She was getting some help from her Aunt & Uncle. a Muslim girl from Somalia. She was wearing a head scarf and a floor length dress or robe or something. But her face wasn't covered and she talked to me. She left when war broke out, which was when she was two. a girl who did a project on STARS which is some kind program to promote sexual abstinence in teenagers. She had gone over to the middle school (Junior High School in other words) to present this information and what she got from the kids over there was that it was too late. Evidently she should be selling the program to elementary school kids. a girl who did a project on Parkinson's disease. She knew someone who had it. a girl who wanted to be a writer and had started on a novel. a guy who had done a big drawing of emergency workers. He was working for the local ambulance company servicing the vehicles and he had made up a large drawing that combined several emergency scenes into one. a girl who had several drawings of horses that included parts of their skeletons. Horses have a bunch of leg bones, more than you or I.
a girl who had been riding along with the local police did a project on adrenaline. I saw several projects on the same or similar topics, I saw some that were so simple they were self explanatory and some that looked intriguing, but I didn't have time to investigate. There were more exhibits in a third room that I didn't even realize was there until it was all over. Mostly it was seniors standing around waiting for the judges. Each project was supposed to be judged by two judges, but not all projects got judged by two. In any case, the witching hour was 8PM and as soon as it hit everyone packed their bags and headed for the doors. 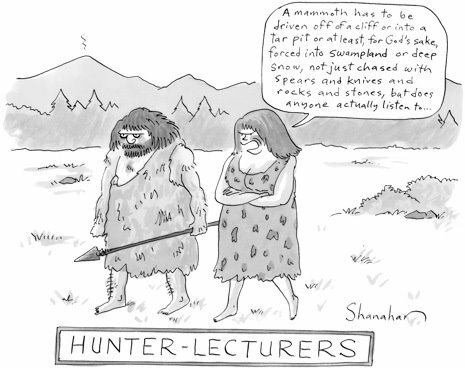 From "The Death Of Kings" by Nick Paumgarten in the May 18th issue of "The New Yorker", 2009. There are two points here that I like. One is the comment about the term "middle ages", the other is the description of the end of the Roman Empire. This essay gave me some negative feelings about economy, and then I heard that China was grumbling about how we might need a new world currency to replace the dollar. (The dollar replaced the pound back in the 1920's when the Great Depression started in Britain.) So I went and looked up some of the big stock market indices and they were somewhat reassuring. Teacher supervising four high school students at detention: "... Just consider why it is you insist on being cruel to one another." Wiseguy student replies: "Because it's high school and we hate ourselves?" From the "Detention" episode of "Cold Case", which I just watched this evening. Originally aired January 15, 2006. Last night my wife and I went to see "Distracted" at the Artists Repertory Theater on Morrison in downtown Portland. Nominally about a family with a hyperactive 3rd grader, but just about every character in the cast was some kind of crazy. Interspersed throughout were asides to the audience about just how crazy either the characters, or the actors playing the characters, were. There were numerous funny bits, some just for fun, some because they mirrored modern life so perfectly. They explore all the various approaches to dealing with the problems their son is running into without coming to any conclusion other than they love for their son. Great show! This evening we watched "Red Road" on DVD. Supposedly the best thriller of 2007. No, it's not. It's definitely not a thriller. A bit of a psychological drama I supposes. We've got a widow stalking the paroled killer of her husband and daughter. It's been years since their death, but she is still sleeping with their ashes. Having a hard time letting go. There is some suspense in that you are wondering just what is going on, but mostly it's just a study of people. Crazy people. Ordinary people. People you run into every day. When I was learning how to drive, cars didn't have headrests, or seat belts for that matter. When I needed to back up a car, I would turn in my seat and put my right arm along the top of the back of the front bench seat. Cars didn't have bucket seats then, either. I would steer with my left hand. I would continue to operate the pedals the same as when I was facing forward. Between twisting my body and my neck I was able to look straight out the back window and so see where I was going as I was backing up. I don't know if they even make cars with bench seats in the front anymore. I suppose there might be an economy model of a full size pickup truck that has a bench seat. But even if it has a bench seat, it will have headrests. So backing up has become, if not more difficult, as least more awkward. If you remain facing forward, all you can see in back of you is what you see in the mirrors, and that doesn't really give you a good picture of what's back there. If I am in a touchy situation, I will squirm around until my upper body is facing the right side of the car and I can turn my head far enough that I can see where I am going. This means leaning forward enough to be able to get my shoulder into the seat. In the pre-headrest days, your shoulder would go over the top of the back of the seat, so it wasn't such a big deal to turn your body far enough to see out the back. I suppose you could improve rearward visibility with wide angle mirrors or a video camera. A video camera mounted on the back of the vehicle that could show you how far away you are from the post might be a nice option. But I would like to see a drivers seat that has a cutaway for your right arm and shoulder so you easily make a half turn in your seat. This would mean the headrest would need to be supported only on the left side, or perhaps from the roof. But it would make backing up much easier. If it's supported from the roof, it can't block your vision. Perhaps all we need is a hole in the seat to put your shoulder in when you twist to the right. I vaguely remember some time ago mistaking a Hyundai for a Jagaur. I remember the Hyundai had a chrome strip along the top back edge just like the Jag. Yesterday I am walking into Heaton's lot to pick up my truck and a black sedan goes by. I think it's probably a Hyundai. 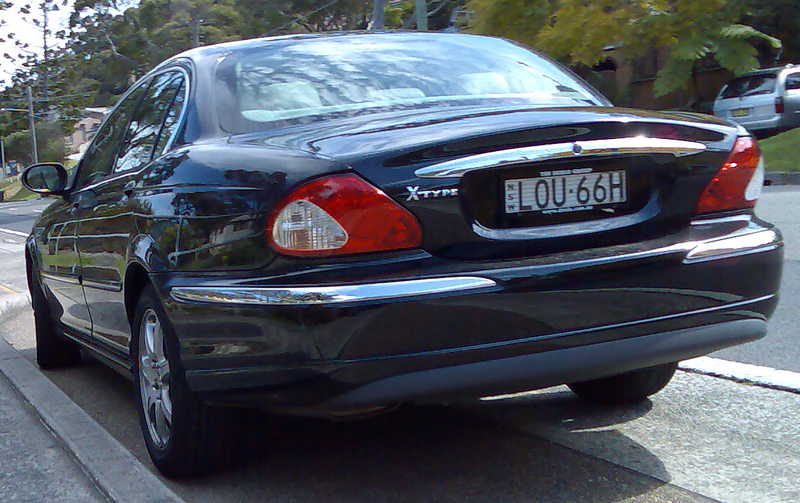 I get closer to the office and I walk past where it is parked and no, it is not a Hyundai, it's a Jaguar. Huh. So now I embark on a search for pictures to prove that I am not seeing things and I am not getting any reassurance. They are similar in overall style, but I do not see any similarity in the details. But then each is just one of a number of models made by each manufacturer over the years, so maybe there are other models that are more similar in appearance. I went to a meeting of the Willamette Writers last Tuesday evening at The Old Church in downtown Portland. That's the pipe organ in the picture. Laura Whitcomb gave a talk about some of the tricks/techniques she uses for writing a book. At one point her latest book "The Fetch" was the number 3 best seller in its' category on Amazon, right behind Twilight #1 and Twilight #2. She spent 20 years writing her first book, but once she got it published, the publishers started asking for more, and now she has four books on the market. I was talking with a small group of people after the presentation. One of the people in the group was Working Kirk Reeves. He was dressed in a white tuxedo. He reminded someone of a character in the video of Blondie's Rapture. I like Blondie, and I remember listening to this song, but it's really very silly. Nonsense actually. And this is where we take a right turn into Voodoo land. Someone else suggested that perhaps he was dressed as a voodoo character. 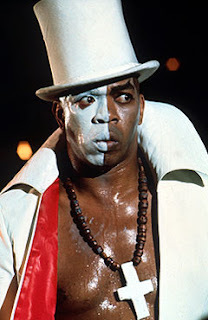 That would be Baron Samedi, who actually wears a black tux. But it's something every witch doctor should know. This picture is a character from the James Bond movie "Live and Let Die". Another writer tells me the color of his Toyota FJ is Voodoo blue. Now tell me the spirits were not at work here. Update July 2016 replace missing pictures. Google has something called a Reader that you can use to subscribe to and read multiple blogs. Something I just noticed is that if you post something on your blog, and then later decide maybe it shouldn't be posted, it's too late. You can save it as a draft and it won't appear on your blog itself, but it has been sent on it's way in the subscription stream and there does not see to be any way to call it back. Likewise with typos. Once you post something, as far as the subscription feeds, that's the way it stays. You can correct mistakes and they will show up on your blog, but the subscription feed is that way forever. Went to the meeting at Backspace on NW 5th Avenue in downtown Portland last night. Talked to a couple of people, or rather listened. He had small board for a chassis with a gearmotor on each end driving frisbees for wheels. He was using an AVR microcontroller for brains and 4 AA batteries for power. It was rolling around on the floor, but it wasn't performing as expected. The creator said the problem was that when the motors reversed direction, the power draw increased so much that the voltage dropped to the point that the microcontroller reset. A reasonable deduction. My solution was to use bigger batteries. His solution was to use bigger capacitors. He had some big caps in his circuit, but big is a relative term. Big for digital electronics is one thing, big for electromotive applications is another. He was using caps the size of the tip of my little finger. He might need caps as big as your thumb. The motors weren't that big, sort of your standard motor for models, about an inch each way, but with an attached gearbox. Another fellow expressed some interest in the inner workings, and so the creator launched into a long explanation of what microcontrollers are and what kinds of features they include. I spent several years in that world, so I excused myself and went and ordered some tacos and a cup of coffee. The coffee was only buck, and I got a real mug. Had to pour it myself from the hot pot. Still a pretty good deal. Even had half & half on ice. I wasn't too sure about the tacos. They weren't anything like what you would get at Taco Bell. They weren't too spicy, which was good for me, but I'm not sure they had any meat. I think it may have been some kind of vegetable stuff. Tasty enough, just different. 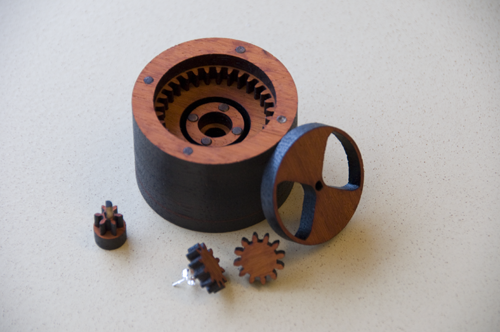 Came across a little wooden gearbox sitting on a Mac, with a web browser open to a page describing the device. Wooden gears as earrings, with their own case, made as a present for Mothers Day. Very clever. Ran into a guy I had seen the last time I was at one of these meetings. That time he was working with a radio controlled toy car. This time he was working on one of those clip-on oxygenation meters they use in hospitals. I was impressed the first time I ran into one. 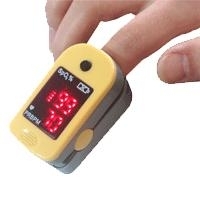 They clip onto the end of your finger, shine a light through your finger, and by the color of the light that comes through they can determine how much oxygen your blood is carrying. This guy was using red and infrared LED's (Light Emitting Diodes). He had the output from the detector hooked up to his parallax oscilloscope. An enthusiastic dude came up and started asking questions at that point and due to the high ambient volume I was not able to follow their conversation. I think there was some mention of using DSP (Digital Signal Processing) to extract pulse information from the data stream. It wasn't obvious from the oscilloscope trace. The brake warning light came on in the Mitsubishi Endeavor a couple of months ago. The car only has 25,000 miles on it, the brakes can't be worn out yet, and they are working fine. Probably some kind of electronic glitch. I used the parking brake a couple of times, maybe the switch for that had come loose. Finally took it in to Heaton's today for its' Spring oil change, and they checked it out. It was low on brake fluid, but the pads still had 50% of their thickness remaining. I talked to a mechanic about this, and generally when the brake fluid is low, it means the pads are pretty well worn and it's time for new ones. (As the brake pads wear, the pistons move out to compensate, and the brake fluid migrates from the reservoir to the caliper.) But not this time. The reservoir is a pretty good size too. It looks like it holds about a cup of brake fluid. It's full up now and should be good for a couple more years anyway. The rear hatch support struts are slowly loosing their oomph. Doesn't bother my wife, she is just short enough to walk under the hatch when it is open. Me, I run right into the it. 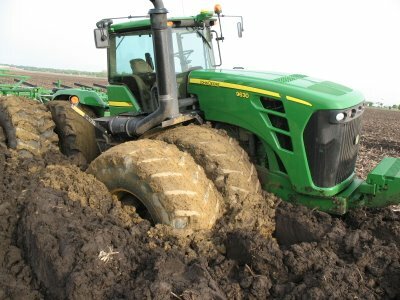 Just another couple of inches and all would be well, but no, the stupid things have to leak. So now I have to buy new ones. They might be covered under warranty, but the dealer in Beaverton where we bought the car has gone out of business, and the next nearest Mitsubishi dealer is in Milwaukee, umpteen miles away, over the river and through the woods. Not hardly worth the trouble. My son wrote this essay for the SAT two years ago. He got a score of 2 out of 12. I like the essay. I think he should have gotten a better score, but then they are not looking for original thinking in the SAT. The only hero there ever was worth celebrating is Linarius, the greatest spellsword this world has ever known; he battled the great Warlock Norakamorth on top of the fiery mountain to save our people. For centuries he has watched over us. These kind of heroes are worth having, for without their awesome powers, we would all be in the Warlock's hellish kingdom, serving as concubines to the great evil one. Heroes are glory-hogs, even Linarius only did what he did for fame. He honestly doesn't care if we live or not. But, enough pish-posh, I'd rather write amazing tales of drunk, dragonslaying womanizing bloodknights then go off and write a load of bullcrap about heroes. Last night we received a emergency phone call from Bobbi (the daughter). She then put the Tucson Police department on the phone. Bobbi's car, 2007 Honda Civic Hybrid, was stolen from in front of her house. A week ago her apartment was burglarized, (while she was asleep?!?!) her bass guitar and car keys were stolen. She reported that to the police but not to us. $1350 to get Honda locks changed, not able to afford that she just took everything of value out of the car. The apartment manager changed her apartment locks. Cops say college kids are easy and common victims to predators. The kids have stuff and they are unaware. The Honda did have Lojack. The police would not pursue the thieves unless Bobbi and her mom agreed to prosecute. "Damn right we'll prosecute" says Bobbi. Thanks to Lojack, the Honda was recovered within a couple hours miles away on the other side of town in a trailer park. The thieves tried to remove the speakers, tearing up the interior. No arrests made. California Bob went to Tokyo and all I got was a box of instant beer. Oh, wait, it's not beer, it's caramel candy. Is it beer flavored caramel? Or maybe carbonated? I'm almost afraid to open it. My friend Marc bought a milling machine the other day for his home shop. Being the ambitious type, he didn't settle for one of your little table top models they make for hobbyists. He got a used production CNC (Computerized Numerical Control) mill. It's Matsuura MC-560V and it weighs five tons and measures about eight feet every which way. He still has to move it to his shop and it is going to cost more to move it ($650) than it cost to buy it. It was built in 1987 and probably cost a gazillion dollars when it was new. There is still the small matter of tooling (notice the twenty position tool cassette is all empty). The cost of cutters can add up quickly, but you don't have to buy them all at once. You only need to have the cutters you need for your current project. And then there is the matter of speed control for the cutting head. The current one is fried and will need to be replaced. The cutting motor runs on three phase current and the controller varies the frequency of this three phase current to control the speed. Sounds really specialized and really expensive, but it turns out to be a very common type of controller for these kinds of machines. Worst case it might double the cost of his investment. This has got to be the coolest toy ever! Update: Marc rented a 10 ton (20,000 pound) capacity forklift along with semi-tractor, lo-boy trailer and driver and got this machine moved to his new digs. From Marty North & Greenfield Park. For some reason it isn't enough that we have an election each Fall, we also have one each Spring. At least this time there are not any tax bills on the ballot. A while ago we got a double majority rule for these odd ball elections: more than half of the registered voters had to vote, and more than half of them had to vote in favor of the bill for it to be passed. Problem was most people ignored the spring election and so you could get a new tax bill passed with relatively few people in favor of it. When those people who hadn't been paying attention found out what happened, they weren't too happy, and eventually we got the double majority rule. I think it's a good rule. One election a year is enough. If you are running a government agency that depends on tax revenue, then eliminating the chance of getting a tax bill passed in the Spring means you need to: A) plan ahead more than six months, and B) make a good case for your tax bill. all of the school board jobs are volunteer positions, no compensation, not even for expenses. If I want to find out what the duties are that go with the position, I need to talk to the school district in question. In this case it would be Hillsboro. We have a dozen people running for four positions. I will ask my wife what she thinks. She pays attention to things like this. Is it "the font of all wisdom", or "the fount of all wisdom"? Either one sounds correct. This question occurred to me the other day, and not having a reference handy, I made a note. Turns out that if you are talking about the source of all wisdom, either one is correct, but if you are talking about what typeface is being used, font is the one you want. The typeface of all wisdom? Would this be the character set that God used to inscribe the ten commandants on the stone tablets for Moses? We may never know what that looked like, and I think that would be a pretty elitist attitude for a font. Personally, I like Times-Roman, which is what I think I am seeing on the screen right now, although who knows? It could be some variation. I got an email from an agency in San Diego. They are looking to fill a temporary AR position in Orange County for 3 months, for $16 an hour. And they want to know if I know of anybody. WTF? In this environment they must have people beating down the door for any kind of job. Why would they have to cast around to fill this crappy position? Let alone send emails to Northern California, saying "Do you know of anybody in your network...?" Another thing: I see LOTS AND LOTS of ads for accounting jobs, many right in this area, asking for specific cost accounting experience in the tech industry, which matches my experience exactly. I'm surprised to see the ads, considering there are massive layoffs in the news every night. Nonetheless I send out lots of resumes, but get zero response. This doesn't make sense to me either. I think I must be missing something. Feels a bit like being in the Franz Kafka International Airport. I'm saying, given the recession and all the recent layoffs, I expect the job market to behave a certain way. It's not behaving that way and I'm wondering why. When things don't make sense, someone is usually lying. Employers often have obscure motivations for advertising jobs they have no intention of filling. So all the ads can be explained. Why agents are reaching out as though they're having trouble filling positions, I can't explain. A lot of people are just trying to look busy these days, maybe that's the simple explanation. "Jesus is coming, look busy." I read about the coming demise of Pontiac the other day and it got me to thinking. Not about the loss of the brand, or the loss of all the really cool future Pontiacs that will never be made, but about the disintegration of the Pontiac team: all the people who worked on designing Pontiac cars will be cast to the winds. The idea of a car is pretty simple. Actual cars are very complicated. Using a car requires only very limited knowledge of how it works. Cars need fuel, you purchase fuel at gas stations. Tires need air. If the air leaks out, the car doesn't go so well anymore. That's about it. Some people spend the time and effort to learn more about how they work, and use that knowledge to take better care of the machinery or even to effect repairs themselves, but that's their choice. It isn't really necessary. The more you learn about cars, the more you realize how much you don't know. For instance, inside the typical internal combustion engine you have pistons sliding in cylinders, both of which are typically represented as being circular. Cylinders might be, but pistons are actually slightly oval in order to wear better and last longer. If you were rebuilding an engine yourself, you might be checking the dimensions of various parts to the nearest thousandth of inch. Manufacturers typically measure parts to the nearest ten-thousandth of an inch, and they do it with automatic machinery. And then there are the materials. Cars used to be built of iron and steel, but I doubt there is any simple iron or steel in a modern car anymore. Every part is made from a specific alloy designed for that specific use, from fenders to gears, from seat frames to axles. There are cars these days that cost a million dollars, should you want to spend that much. What you may not realize is that just about any modern car, if it was built in limited quantities like very expensive cars, would cost just as much, even your lowly Yugo. There is a tremendous infra-structure in place devoted to the mass production of automobiles. Volkswagen recently spent a billion dollars to build a new automobile factory in Germany. If they only built a thousand cars using that factory, the overhead alone would be one million dollars each. Got in my truck last Sunday and turned the key and was rewarded with a resounding click. Click? That's not good. Truck is ten years old, the battery has been replaced once, and with the way batteries fail these days (One day they are fine and the next they are kaput. It's not a gradual process any more.) it's probably time for a new one. I try jump starting it, but no help. Let the cables stay connected to the car-car's battery for a minute while it is running just in case, you know, the truck battery is really dead. No help. Get the VOM (Volt-Ohm-Meter) out. Battery shows 13 volts. Wedge the leads in the battery cable fittings and turn the key. Big fat click and the needle doesn't budge: rock steady at 13 volts. Okay, it's not the battery, it must be the starter. I suspect the contacts in the solenoid are probably shot. Give it a few more tries and it finally starts. Take it down to the shop and leave it with them. They get around to sorting it out a couple of days later. Turns out it was just corrosion on the battery terminals. On one hand I am really embarrassed, I saw a bunch of green corrosion growing around the positive terminal, but I didn't figure it was a problem. Used to be (30-40 years ago) corroded battery terminals were the number one cause of starter problems with cars, but I haven't seen a terminal that was corroded enough to cause trouble since I don't know when. On the other hand, it doesn't make any sense. The meter was connected on starter side of the battery terminals, it wasn't connected to the posts, so the corrosion was between the meter and the battery. When I turned the key, the voltage should have dropped to zero, but it didn't. Something funny going on here. But it's working now, so I guess I shouldn't worry about it too much. Bugs me though. They also fixed the flakey turn signal. The left blinker started flashing very fast a couple of weeks ago. Both front and rear bulbs are working, so I'm thinking there is a short in the wiring, either in the dinged front fender or in the tilt steering column. I read about that last one on the internet. The mechanics tell me they replaced a couple of bulbs and now it's fixed. This is another one I don't understand. If a bulb is burned out, less current will flow, and the blinker should blink slower. If you have a wire that is shorted to ground somewhere, more current will flow and the blinker will blink faster. Both lights were blinking much too fast, they changed the bulbs and now the lights are blinking at the correct rate. I don't get it. Changing light bulbs should not have had any effect. Lastly, the automatic transmission needed two (!) quarts of fluid. There is no sign of a leak, so where did it go? I had another car that did this and it was caused by busted diaphragm in the vacuum operated downshift control. The engine was sucking the ATF up the vacuum line and burning it. No leak, but the fluid was disappearing. That's my suspect right now, but after these other two problems, I am not so sure I know anything about cars anymore. phones ringing off the hook at the clinic this am....seems a mother had visited Mexico, then brought her 5-yo son to a birthday party over the weekend . . . ...whoo-boy, panic central. I hear nice voices talking on the phone explaining what's in the news patiently... . . "Yes, Ma'am, only one death in the entire United States...yes ma'am....no ma'am, we are not recommending quarantine at this time..." Yet Iowans are reasonable people, and the din was limited to a few yahoos who boarded up their windows and are hunkered down, shotguns in hand, for anything that moves in the grass. The police have been dispatched to diffuse the situation.